SOLD OUT...Still the animal print choice this year� zebra. Easy care nylon exterior black and white lunch tote. Interior has inside mesh pocket and outside velcro pocket. Generous size, fits a tall water bottle or food container. 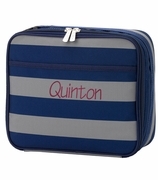 The personalized zebra lunch bag measures 9"W x 11"H x 6.5". Zipper closure.